Perfect Location - Quiet Street in Downtown Edgartown! Come Stay at Our House! Just two blocks to the Whaling Church and all that Edgartown has to offer. New Addition & Pool! Charming vintage home in the heart of Edgartown Village on a quiet one-way street, with newly added addition and pool! Parking Downtown Edgartown- Priceless! Walk to Shops/Movies/Restaurants/Fuller Street Beach. Wireless Hi-Speed Internet! New Additions Include - New Patio/Pool Area with Huge Outdoor Shower & Weber Grill, Breakfast Room, Sun Room with Wood Burning Fireplace, New Master Suite, Sitting Area on 2nd Floor, 1st floor Laundry area & 1/2 Bath. 1st floor Living Room Dining Room, Eat-In Kitchen with Breakfast Area & peninsula, Bedroom with Queen bed, bathroom with shower stall. 2nd floor- Full Bath with cast iron tub/shower, Bedroom with Full Bed, Bedroom with (2) Twin beds, Loft Area with Apple TV & Cozy Sofa, Private Master Suite with King Bed, Marble Bath with frame-less Walk In Shower and Marble-topped double sink vanity. Available to tenants: beach chairs/umbrellas/toys, boogie boards, coolers, adult bikes, 1 child bike, 1 bike trailer. Please email me with any questions. Thanks for considering our home for your vacation! We are past renters who fell in love with the Vineyard on our first trip. We couldn't find a rental house that we loved so we created one! This house is our dream! A few short blocks to Whaling Church! Walk to shops, restaurants and the movies! Wood Burning Fireplace in Sun Room. Sorry - No Garage Access Is Available On This Property. Both Keurig & Drip Machine Available. New Breakfast Room Addition with Counter Seating. We have been enjoying the Vineyard and what it has to offer for the past 19 years. It’s a special place for our family. 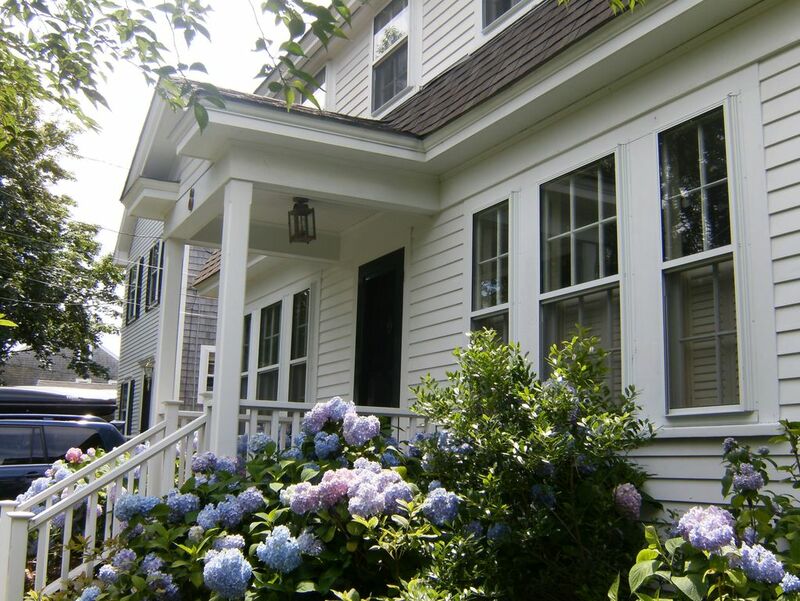 For the past four years we had the good fortune to experience the Vineyard by staying at the charming in-town home on 8 Green Avenue in Edgartown. Having spent time in various towns and homes on the island I can truly say this is a wonderful location and home. You are in walking distance to beaches, restaurants and shops. It’s the best equipped house, for enjoying an at home dinner to playing at the beach or cycling to explore the island, they have all that one could desire. If you’re planning a stay on this majestic island this is the perfect location to experience your vacation. We look forward to many more years and memories. Thank you to the wonderful owners for opening their home to our family. This is a must to experience. Beautiful, comfortable and perfect ! In-town Edgartown. Approximately 3 blocks from The Whaling Church. Quiet one-way street.